Scott McDonald scored on his Partick Thistle debut as the Jags beat Alloa Athletic to move out of the Scottish Championship's bottom two. The former Celtic and Motherwell forward came off the bench to double the visitors' lead with shot from inside the box. 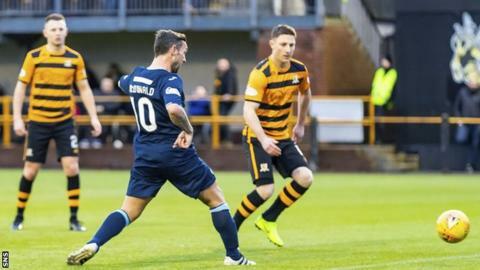 The goal ended Alloa's hopes of climbing off bottom spot, with Blair Spittal having struck Thistle's opener early on. The Wasps remain a point off Falkirk. And the Bairns now trail Partick by the same margin, with Thistle and Falkirk both having played one game fewer than Alloa. Match ends, Alloa Athletic 0, Partick Thistle 2. Second Half ends, Alloa Athletic 0, Partick Thistle 2. Corner, Alloa Athletic. Conceded by Stuart Bannigan. Iain Flannigan (Alloa Athletic) wins a free kick on the right wing. Corner, Partick Thistle. Conceded by Andy Graham. Conor Hazard (Partick Thistle) is shown the yellow card. Corner, Alloa Athletic. Conceded by Jack McMillan. Attempt blocked. Jack Hamilton (Alloa Athletic) right footed shot from the centre of the box is blocked. Substitution, Partick Thistle. Callum Wilson replaces Gary Harkins. Attempt saved. Scott McDonald (Partick Thistle) right footed shot from the centre of the box is saved in the centre of the goal. Substitution, Alloa Athletic. Jon Robertson replaces Steven Hetherington because of an injury. Corner, Alloa Athletic. Conceded by Blair Spittal. Craig Slater (Partick Thistle) wins a free kick on the right wing. Goal! Alloa Athletic 0, Partick Thistle 2. Scott McDonald (Partick Thistle) right footed shot from the centre of the box to the bottom left corner. Assisted by Lewis Mansell. Substitution, Alloa Athletic. Jordan Kirkpatrick replaces Kevin Cawley. Kevin Cawley (Alloa Athletic) wins a free kick on the right wing. Attempt blocked. Scott McDonald (Partick Thistle) right footed shot from the left side of the box is blocked. Scott McDonald (Partick Thistle) wins a free kick on the left wing. Substitution, Partick Thistle. Scott McDonald replaces Aidan Fitzpatrick. Delay in match Sam Roscoe (Alloa Athletic) because of an injury. Attempt missed. Andy Graham (Alloa Athletic) header from a difficult angle on the right is too high.